805 Kabob is the one of the newest additions to the Isla Vista food scene, offering fresh and authentic Middle Eastern cuisine at a college-student friendly price. This down-to-earth establishment is right off of Trigo Road, filling the place of the late Lovin’ Oven. The owner of 805 Kabob, Matt Maida, is also the owner of S.O.S. Liquor on Embarcadero Del Norte. As one of the thriving business owners of the Isla Vista community, Maida is quite knowledgeable of the food options in I.V. “In I.V., there are not many options of food that I enjoy,” Maida shared. The major purpose of opening the 805 Kabob is to broaden the variety of Isla Vista food. Lovin’ Oven, the late business that once stood where 805 Kabob now stands, was a Mediterranean bakery that served sweet and savory baked goods. Although a master at its craft, Lovin’ Oven eventually died out due to a market that was too narrow. 805 Kabob serves a variety of grilled dishes such as kabobs, gyros, shawarma, kafta and falafel, all at an affordable price. The well-known favorite is the regular plate, which includes two main dishes and three sides at an unbeatable price of $8.99. The customizable plate is one of the shining features of 805, which sets it apart from its competitor, Aladdin Cafe. One of Maida’s goals for 805 is to ensure that people’s first time eating Middle-Eastern food entails a great experience. “If you eat shawarma but the product is bad, then you will never eat shawarma again. But not here,” he said. All these spectacular items on the menu go through a process of fine-tuning in order to ensure all customers are getting the best product. “I taste and approve everything first. Our chicken shawarma is one of the best,” Maida said. 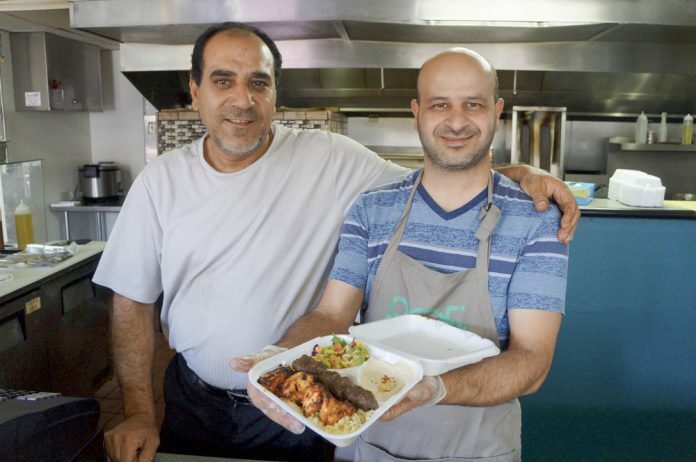 The ambience of 805 Kabob is simple, homey, and admittedly scarce, all of which can be attributed to the business’s budding nature since 805 Kabob has been open for approximately two months. The setup of the restaurant is definitely geared towards the “to-go” dining set-up, which was Maida’s intention. This set-up allows to keep costs low, prices affordable, and customers flowing through. Maida, being the businessman he is, also shared that he is no stranger to the restaurant business; he and his brother previously owned a restaurant focused on Middle-Eastern barbecue. Utilizing his knowledge of food to cater to I.V. residents, 805 Kabob was born. What sets 805 apart from other to-go food establishments is the quality of food they produce. “We serve restaurant quality food to go,” Maida explained. During dinnertime the place is particularly packed for the chicken kabob, the most popular dish on the menu for a good reason. The chicken is freshly marinated and seared on the grill right after your order is made; there are no heating lamps in sight. There is also an in-house fire oven, kept from the Lovin’ Oven, but put to good use in 805 Kabob. A bakery menu is featured at this restaurant, serving Manakish, a pita-like bread that is topped with either cheese, ground beef, chili, or Za’atar (a mix of Middle-Eastern herbs). 805 Kabob has been open for approximately two months; this restaurant is definitely an up and coming spot for I.V. residents to discover. Yet even within this short period, 805 Kabob has attracted regulars. “We have regulars who come in everyday and order the chicken; they don’t get tired of it!” Maida shared with a laugh. If you yearning to break out of the regular grub routine of Habit or Freebirds, 805 Kabob is a fantastic, flavorful, and fresh option for food. 805 Kabob is located on 6578 Trigo Road.